Micro businesses are very small companies run by their owners with few or no employees. They are often home-based, with annual sales under $250,000 and few assets. Successful micro businesses have been built on everything from a widely loved family recipe to skills in something that others need, such as sewing, photography, computer services or bicycle repair. Many of these businesses start with a hobby or a great idea. Regardless of the type of venture you choose, business success depends on your having the information to make wise choices, the money to survive during the early stages and an honest evaluation of your skills and needs. This guide will help you ask—and answer—many crucial questions before you dive into entrepreneurship. If you decide to move forward, it provides valuable resources to help you establish, manage and grow your business. Your business plan is an essential written document that describes your concept, outlines your objectives, forecasts costs, and details the strategies you will take to achieve your goals. A formal business plan is a requirement if you plan to approach lenders and/or partners. If you don’t, then a business plan is optional, but the effort you put into writing one will almost certainly be well worth it. First, there’s evidence that people who write a business plan are more likely to actually start a business. The process also forces you to ask key questions such as: What does the market for my product or service look like? Who would be my competition, and how would I differentiate myself? Who are my potential customers? How will I reach them? What will it cost me to get through my first year? Where will that money come from? It’s a good idea to avoid complex language and jargon, keep the document to 20 pages or less, and include a one-page "executive summary" as your cover page. You can often find free or low-cost classes on writing a business plan, typically offered by the local Small Business Administration (SBA) or SCORE chapter or another non-profit. (View the SBA’s "How to Write a Business Plan Video.") And many websites, including SCORE.org and Nolo, offer free business plan templates. A business plan typically includes financials—projections of sales, expenses, assets and cash flow. Profit and loss (or income) statement. This is a financial report that summarizes revenues and expenses every three months (quarterly) and annually (each year). It shows your "net income"—the amount you have left after all expenses are subtracted from revenues. Cash flow statement (or forecast). This report helps you calculate future expenses to make sure you have money to pay your bills. A successful business must have a good "cash flow" (sometimes called "working capital") from sales and receipts. Forecasting means estimating the cash that will flow into and out of your business over time, including sales, cost of goods, payroll and taxes. It’s important not to stretch facts or figures—exaggerations could come back to haunt you if you present the projections to potential lenders or partners. Be honest about problems that could arise in the business, and provide a detailed plan for dealing with them. This way, you are better prepared to face challenges, and investors and partners don’t get any unpleasant surprises. Is my idea feasible? Is there demand for my product or service? Do I have the experience and background to make my idea flourish? Am I the kind of person who can be my own boss? Is this a business with a good chance of success? Who would be my competition? If there are already a number of businesses in this field, is there a way to overcome the issue of competition, such as operating in a different neighborhood or appealing to a demographic not already served? How will I attract customers? What options for promoting my business are available and affordable? When you start a business, you must choose which business structure—legal entity—to adopt. Sole proprietorships (a single owner) and partnerships (two or more owners) are the easiest and least costly ways to set up—or "structure"—a business. Owners have authority over all business decisions, but they must report business income and losses on their personal tax returns and are personally liable for all business-related debts. If your business fails, you may have to file personal bankruptcy. If you abandon debts or file bankruptcy, your personal credit history will be damaged. A corporation is a legal entity organized under state or federal law that is legally separate from the people who own it. Corporations, like people, can own property, incur debt and sue or be sued. In most cases, business owners who incorporate are protected from personal liability arising from their business dealings or lawsuits against the company. A limited liability company (LLC) is a business structure designed to combine features of a corporation and a sole proprietorship or partnership. An LLC offers some protection of personal assets and protection from personal liability, and is an option whether the business has one or multiple owners. There are more legal requirements for an LLC than for a sole proprietorship or partnership, but fewer legal requirements than incorporation. Lawyers charge about $1,500-$2,000 for the work involved in creating an LLC. It’s possible to set up an LLC on your own, without an attorney, but the process can be challenging. Learn more in Nolo’s "How to Form an LLC." LLC owners must regularly file a renewal or similar required document with the state (frequency, cost, etc. are determined by the laws of the state where the LLC is registered). If an LLC’s legal preparations are faulty, your personal assets may not be protected. Consider forming a limited liability company (LLC) or a corporation if your business puts you at risk of being sued by customers and/or you have substantial personal assets to protect should your business fail. No one legal structure is best for all micro businesses. Each business must consider several factors, including size, profitability and potential liability, when making a choice. The SBA says that only about half of all businesses survive five years or longer, and around one-third manage to survive 10 years or longer. Many businesses fail because they lack adequate funding. Many small companies are started with the founder’s personal savings, so one of the best ways to prepare to start a business is by saving money in advance. However, if you don’t have the money you need, you may be able to borrow it. To be considered for a business loan you must have good credit and the ability to repay the debt. Larger loans often require collateral as well. Funding a business can be risky. You could lose your own money as well as any funds you have borrowed. You remain responsible for your loans until they are fully paid off, even if your business closes. If you’re currently employed, and your new business can be done "on the side," consider keeping your job while launching your startup. This would reduce the amount of money you’d need to save or borrow before being able to launch. Use your own money. If you don’t have cash to invest, consider selling possessions to raise money. Most lenders want to see that you are risking your own money before asking for a loan. Form a partnership. Partnering with an individual who has money to invest in your business, such as a retired businessperson or a friend or family member, can help keep you afloat until your business is earning enough to cover expenses. Apply for a Small Business Administration loan. (For more information, see "SBA loans" below.) You may have to create a "loan package," combining funding from several sources. Consider commercial finance companies. Be cautious, though: In most cases, rates on finance company loans will be much higher than bank loans. Read NerdWallet’s article on the pros and cons of "alternative lending" if you’re considering non-bank funding. Tap your life insurance. If you have whole life insurance with substantial cash value, you may be able to ask for a policy loan. Many companies lend up to 90 percent of the cash value of the policy. However, you should first assess whether the loan will leave your beneficiaries in financial straits if you die before the loan is repaid. The Simple Dollar presents the potential advantages and risks of tapping a life insurance policy. Lease equipment instead of buying it. When you lease, you don’t tie up large amounts of cash. Equipment leases may cover maintenance and repairs. Depending on where you live and your type of business, there may be local "economic development" opportunities to help you. Contact your city, county and state governments and ask if they have economic development offices. Some programs require that you raise matching funds or create jobs in order to qualify. Ask about in-kind credits (goods, commodities or services rather than money) that can substitute as matching funds. To learn more, visit the U.S. Economic Development Administration online. The U.S. Small Business Administration has programs and services available to help micro businesses succeed. The SBA’s primary financing program, the 7(a) Loan Program, provides loans of up to $5 million to help borrowers start, acquire, expand or operate their business when they can’t get financing from other sources or from a lender who won’t make a loan without an SBA guarantee. These loans offer flexibility, longer terms and potentially lower downpayments compared to other financing options. The 7(a) Loan Program also helps small businesses in traditionally underserved markets, offering a more efficient application process for minority-, women- or veteran-owned businesses, or for companies in lower-income or rural areas. The SBA’s Microloan program provides loans up to $50,000 to help small businesses and certain not-for-profit childcare centers start up and expand. Learn more at the SBA Loans & Grants website. The SBA does not provide grants for starting and/or expanding a business. If your business fails, you will still be responsible for your loans. The SBA also helps minority and economically disadvantaged owners contract with the federal government, which is required to earmark a certain amount of business for eligible small companies. Can my business repay the loan out of its cash flow? Could I repay the loan using collateral if my business failed? Do I have a good personal credit history? Do I collect money from people who owe me in a timely manner? Do I have a profitable history? Is the future of my industry bright? How am I positioned against the competition? Many small business owners mix personal finances with business finances, but the Internal Revenue Service (IRS) advises keeping business and personal accounts separate. "Co-mingling" personal and business transactions makes it harder to track business activity and might raise questions about whether your deductions are allowable. Paying for business purchases on a credit card can help you manage cash flow by giving extra time to pay. Some cards give you "perks," such as discounts and rebates. Many micro business owners rely on credit cards to pay for some purchases and track expenditures. But using credit card cash advances to pay for business expenses can result in large balances that are difficult to repay. In most cases you must accept personal liability for the charges on a business card. Payments and balances on your business credit card show up on your personal credit reports, so late payments or large balances could hurt your credit score. Business credit cards also may lack interest-free grace periods, which means that you pay interest on all purchases even if you pay your bill in full each month. A business "line of credit" helps you meet temporary, short-term cash flow needs. A line of credit is different from a loan in that you only use what you need, and pay interest only on the outstanding balance. Whatever part of the balance you repay can be used again when you need it. Lines of credit usually have higher limits than credit cards and allow you to convert your credit to cash easily and without a fee. Learn about some business credit line options at NerdWallet.com. As with any business loan application, you will need to provide financial statements and information about your business to the lender. To build a business credit history, register with major business credit bureaus such as Dun & Bradstreet. Most businesspeople need professional advice at different points in their business’s lifetime—someone who can help them identify and/or solve a particular problem, provide a skill or expertise they are lacking, or simply see opportunities that they don’t. A good business consultant can be a great asset, but they can also be expensive. Before hiring a business consultant, check out the free counseling and training services offered by SCORE (formerly known as the Service Corps of Retired Executives). Consultations are provided one-on-one by experienced mentors or through webinars and events. If you do decide to hire a consultant, always compare fees and check references before making a decision. If you are in the start-up phase, you might find free or more affordable professional guidance and support by joining a business "incubator." Incubators are organizations that help new businesses in various ways. They may offer mentoring and training services, physical workspace, access to professional advice, and other supportive tools and information. Whether you take advantage of outside services or not, you must comply with local, state and federal business regulations. Requirements for establishing and maintaining a legal business vary by business type and state. The local SBA, Chamber of Commerce or office of economic development can help you learn about requirements. Check with your city or county tax collector and zoning authority about business licenses, permits and requirements for your industry. On the state level, you might need a sales permit, sales and income tax documentation and any required licenses, as well as workers’ compensation insurance if you have employees. On the federal level, you are responsible for verifying your employees’ right to work in the U.S., withholding employee income taxes and complying with minimum wage, overtime and child labor laws. You will be required to make estimated income tax payments for yourself and pay Social Security and Medicare taxes for yourself and your employees. To obtain information specific to your situation, consider consulting a tax adviser. Your tax adviser can help determine your estimated federal and state taxes and advise you on tax deductions. For general information, visit the IRS’ Small Business and Self-Employed Tax Center. Depending on your business activity, the federal government also might require a special license or permit. Check the SBA’s list of what you might need. Insurance is an unavoidable cost of doing business—without protection, you could be ruined by a catastrophe. There are several key types of coverage designed for business owners, including general professional liability, product liability, business interruption and home-based business insurance. The exact types of insurance you’ll need depends on many factors, including whether you have a brick-and-mortar location, store inventory, use a car in conducting business or have employees. For advice and quotes, consult with an insurance broker who specializes in small business coverage. Contact trade associations for names of insurers with experience insuring businesses in your particular field or industry. You can check with the company that provides your personal insurance, too, since many companies write both personal and business policies. To make sure you are getting the best price and the best advice, talk to two or more agents and compare the recommendations and quotes. Before entering into an insurance discussion, it might help to prepare yourself by becoming familiar with business insurance policy types and terms. The Insurance Information Institute website provides detailed information about the various types of business insurance. And if you have a home-based business, you can learn a lot about your needs and options by reading Consumer Action’s newsletter on the topic. These days, an internet presence is crucial for just about all businesses—even those that work or sell only locally. Consumers have become accustomed to being able to find what they’re looking for online, whether products, services or information. The lack of even a simple website can result in frustrated or lost customers. There are many online tools for building your own website. This can be a good, economical way to start, particularly if your budget is tight and your business doesn't require a site with lots of "bells and whistles." Online DIY tools make creating a simple site relatively easy, even for those who don’t have previous experience. And since more than 50 percent of consumers browse the web on a mobile device rather than a computer, the top web-building tools automatically create "mobile-optimized" websites. To learn about DIY website design options, visit PCMag’s "The Best Website Builders of 2017." Of course, before you can start building your site, you'll need a domain name—for example, www.mygreatbusiness.com. Read Entrepreneur’s "Do’s and Don’ts of Securing a Domain Name" to get started. While DIY website-building software has the capability to help you create the professional online image you want to present to customers, you have to have the time, patience, writing skills and attention to detail that the task requires. If you don’t, look for someone who can either help you or do it for you. High-end web design companies can be expensive, and, depending on your business, might be more than you need. Independent web designers are likely to be more affordable, though prices will still vary considerably. Students from a community college or other school that has a web design program might be an option to consider. Before hiring anyone, ask to see their past work (portfolio) to get an idea of skill level and whether your aesthetics are similar, determine the specifics of the job (including who will write the text for the site), discuss the process (for example, at what stages will you be asked for input), and request a cost estimate. If you sell products, you will most likely need to build "shopping cart" functionality into your site. All or most of the best website-building tools offer this option, so creating a shopping cart shouldn’t be a hurdle to online sales. But, since you can’t take cash over the internet, you’ll have to find another way to collect payment. Being able to accept card payments is critical to most online businesses’ success. To learn about your card payment processing options, including pros, cons and cost, read FitSmallBusiness.com’s "How to Accept Credit Cards Online—for Small Businesses." Once you’ve got your website built and, if needed, your shopping cart and payment processing functionality in place, it’s time to drive traffic to your site. The easiest way to do that is to include your URL (website address) in all your communications (business cards, forms, email signature, brochures, etc.). For dozens of other ideas for attracting site visitors, do an online search for phrases such as "how to promote a small business website." Make sure that your website includes specific calls to action so that your efforts to attract traffic aren’t wasted. Depending on your business, that might include asking visitors to purchase something, contact you, add their names to your email list, subscribe to your newsletter, request a quote or refer a friend. Designing before determining your target market and goals. Making your website too flashy or busy. Making the content too text-heavy. Allowing typos and other mistakes. Not having others evaluate your website before launching. Failing to keep the content up-to-date. Not making it easy for visitors to take action. Once you’re in business, bookkeeping becomes an ongoing task—something you will need to make time for or hire someone to do on a regular basis. Accurate bookkeeping is essential for any business. Your books should include receipts and records of every sale, payment and expenditure. By keeping accurate books, you can closely monitor your profits and the value of your business. Remember that lost receipts for business expenses can result in lost deductions on your tax return and, therefore, more of your money paid out in taxes. Developing good recordkeeping habits can ultimately save you thousands of dollars. Using business accounting software makes accurate bookkeeping much quicker and easier than it used to be. QuickBooks is probably the most popular small business accounting software program, but there are others. Find the system that works best for you so that maintaining your business’s financial records is something you won’t avoid. If necessary, hire someone for a few hours per week or month to help you. Before you start using your new bookkeeping system, you will have to choose between the two methods of business accounting: cash basis versus accrual. The main difference between the two is the timing of your income and expenses. Using the cash basis method, you would record income when you receive it and expenses when you pay them. Using the accrual method, you would record transactions when they take place, even if no money changes hands until later. Which method you should choose depends on factors such as your business structure (sole proprietorship, LLC, etc. ), whether you are a service business or you maintain inventory (products), and whether or not you extend credit to your customers (accounts receivable). Federal, state and local government agencies, as well as many non-profits, offer a wide variety of resources to help small businesses succeed. Assistance generally is free or low-cost. 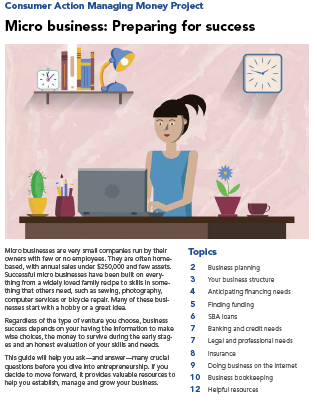 The U.S. Small Business Administration (800-827-5722) provides a wealth of free resources and services—including loans—for micro business owners. In addition to having a robust website, the agency serves small businesses via its network of local field offices and through partnerships with lenders and public/private organizations. SCORE (800-634-0245) is a national organization that offers free and confidential small business advice from volunteer mentors. Small Business Development Centers (SBDC) are local resources that provide businesses with free information, training and specialized one-on-one consulting on marketing, finances, raising capital and more. The Association for Enterprise Opportunity and its partner organizations provide capital and services to assist underserved entrepreneurs in starting, stabilizing and expanding their businesses. The Better Business Bureau provides information about ethical business conduct, standards for advertising and how to protect against fraud. The Minority Business Development Agency is an agency of the U.S. Department of Commerce that works nationally, through a national network of MBDA Business Centers, to link minority-owned businesses with the capital, contracts and markets they need to grow. Entrepreneur.com offers tips and how-to guides on all aspects of going into business. The Internal Revenue Service (IRS) offers free tax-related information, forms and worksheets for businesses of all sizes.